Four-hour deluge washed away not just crops but also soil from 5,000 hectares in Maharashtra. Experts warn of more such weather events. Is the government ready for the challenge? Ingle and Raut are victims of an unprecedented tragedy that struck Mangrulpir and Manora tehsils of Maharashtra’s Washim district on the intervening night of June 14-15. A record 374 mm of rain poured over the region within a span of four hours. The resulting floods washed away one to two metres of soil of some 4,900 ha of agricultural land along the numerous streams and rivers and rendered most of the land unfit for cultivation for years, probably decades. While the district administration blames the disaster on a freak weather event, farmer-activists, climatologists and soil scientists say several forces, right from degrading soil health to encroachment and changing crop patterns, were at work. But the question before farmers is that with the frequency of intense weather events rising, will such disasters also become frequent in future? If yes, then how can one protect the precious soil from being washed away or make the eroded land fit for cultivation? Besides, it is an expensive measure, says Pravin Ghodchar from Warud village. His 2.8 ha field developed wide, three feet-deep gullies after the downpour. 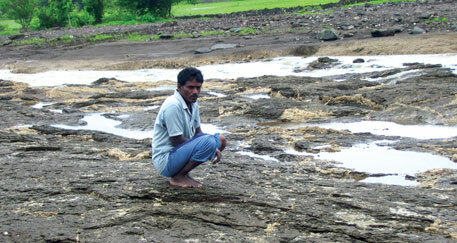 “It will cost me Rs.15 lakh per ha to replace the lost soil,” Ghodchar adds. Both scientists and farmers say rainfall pattern in the region is getting more erratic by the year. “This year, our region saw Mruga nakshatra rains after 19 years,” says Gajanan Amdabadkar, farmer and Shetkari Sanghatana activist from a nearby town, Karanja Lad. The nakshatra (lunar day) heralds a good monsoon season. “People were happy. But the rains turned surprisingly heavy. We have never seen such heavy Mruga rains before,” he adds. There is a strong probability that frequency of such incidents will increase in future, says Ramchandra Sable, climatologist at Mahatma Phule Krushi Vidyapith in Aurangabad. Similar incidents were reported from across the state in the heavy rainfall years of 2005, 2006 and 2007. Farmers can expect rainfall of such intensity once or twice a decade, he warns. But torrential rain is not the only cause of such large-scale erosion. The change in climatic conditions is also impacting soil health in the region. “Western Vidarbha, which used to be semi-arid, has become more arid in the past few years with decreasing rainfall and rising temperatures,” says Jagdish Prasad, soil health expert at the National Bureau of Soil Survey, Nagpur. “At high temperatures, soil’s natural carbon content gets oxidised, affecting soil integrity and making it prone to erosion.” Changing agricultural practices like switching from farm yard manure to chemical fertilisers have further depleted organic carbon content of soil. Riverine ecology expert Nilesh Heda, from non-profit Samvardhan in Karanja Lad, says land use pattern in the region has undergone a sea-change in the past three decades. The two tehsils had extensive grasslands which have been destroyed by encroachment. As if this were not enough, the government has proposed a spate of irrigation projects in the region despite opposition. Nine projects are planned in Manora tehsil alone. “Merely deepening the tanks and nullahs would have solved both the flooding and irrigation problems,” says Amdabadkar. Heda says villages like Wapti Kupti and Bhivri, where his non-profit Samvardhan de-silted nullahs and deepened tanks, escaped the floods on June 14-15 despite the deluge. Collector Ramchandra Kulkarni agrees that de-siltation work has been neglected in the district. “All proposals are stuck in cost revisions,” he admits. In July, while announcing the flood relief package for the Vidarbha region, which includes Washim district, Chief Minister Prithviraj Chavan has provided for dredgers to desilt and deepen nullahs, and ordered district administrations to prioritise clearing of nullahs and rivers. But this may not be sufficient without ecosystem restoration. “Proper compartment and contour bunding of farms, along with restoration of bund vegetation like grass and trees for soil conservation is a must,” says Taley. “Traditional crop patterns and grasslands must be restored to improve cattle numbers and soil health.” Sable says given the increasing frequency of intense rainfall, the government should also set up early warning systems. Automatic weather stations can warn farmers as soon as air pressure drops prior to heavy rainfall. Farmers can then breach their farm bunds in strategic places to let out water and minimise damage, adds the climatologist.